Today, the Fairtrade seal initiative announced a significant increase in the guaranteed minimum price for cocoa. The development organisation INKOTA welcomes this important step to reduce the poverty of cocoa farmers. If chocolate companies were serious about sustainability, they would also have to be prepared to pay more for cocoa. The other two large certification organisations in the cocoa sector should also introduce a guaranteed minimum price. In order to close the gap to livelihoods, however, further price increases would also have to follow for Fairtrade. This is also the opinion of Fairtrade cocoa farmer Elizabeth Osei Agyei and Sandra Kwabea Sarkwah of the NGO SEND-Ghana. On a tour of Germany this week they report on the situation on the cocoa plantations in West Africa. "The price increase was long overdue", says Elizabeth Osei Agyei. 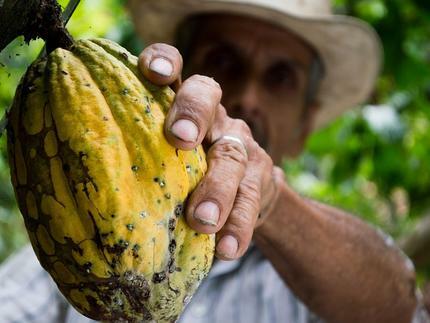 The Fairtrade cocoa farmer hopes to benefit from the increase in the minimum price from 2,000 to 2,400 US dollars from October 2019. "This is an important step to get more people out of poverty." The majority of cocoa farmers in West Africa live well below the poverty line. The income of a typical cocoa farming family in Ghana would have to double in order to secure their livelihood. However, only five percent of the chocolate sold worldwide bears the Fairtrade seal. "The Fairtrade farmers will be better protected from low world market prices in the future," says INKOTA speaker Johannes Schorling. According to Fairtrade's calculations, however, further price increases would have to follow in order to realise livelihoods for cocoa farming families. "If chocolate companies really want to fight poverty among cocoa farming families, they must finally be prepared to pay a higher price for the cocoa. Fairtrade, too, can only move in the direction of livelihood prices if the industry follows suit." This also applies to the other large certification organisations: Utz and Rainforest Alliance do not yet have a guaranteed minimum price.